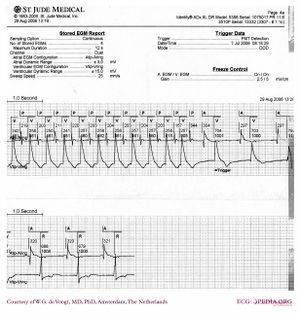 A pacemaker is indicated when electrical impulse conduction or formation is dangerously disturbed. The pacemaker rhythm can easily be recognized on the ECG. It shows pacemaker spikes: vertical signals that represent the electrical activity of the pacemaker. Usually these spikes are more visible in unipolar than in bipolar pacing. 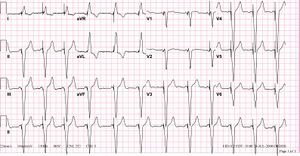 In the first example, the atria are being paced, but not the ventricles, resulting in an atrial paced rhythm. Accordingly the ventricular complex is delayed until the atrial signal has passed through the AV node. In the second image the ventricles are paced directly, resulting in a ventricular paced rhythm. 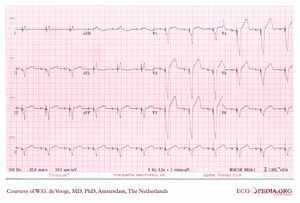 As ventricular pacing occurs exclusively in the right ventricle the ECG shows a left bundle branch block pattern. An exception to this rule is left ventricular pacing in patients with congenital anomalies and patients with surgically placed epicardial pacemakers. Another exception is septal or RVOT placement of the pacing lead, which results in a less widened to normal QRS complex. Atrial sensed, ventricular paced rhythm (tracking). Note the LBBB morphology with left axis deviation indicating the pacing lead in the right ventricular apex. Pacemakers can be categorized according to the NASPE coding system, that usually consists of 3-5 letters. 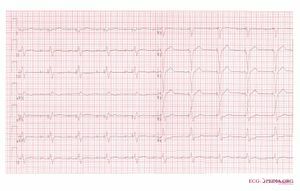 AAI: The atria are paced, when the intrinsic atrial rhythm falls below the pacemaker's threshold. 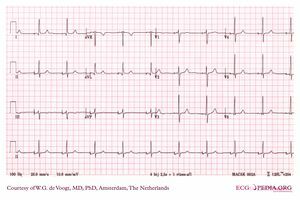 VVI: The ventricles are paced, when the intrinsic ventricular rhythm falls below the pacemaker's threshold. VDD: The pacemaker senses atrial and ventricular events, but can only pace the ventricle. 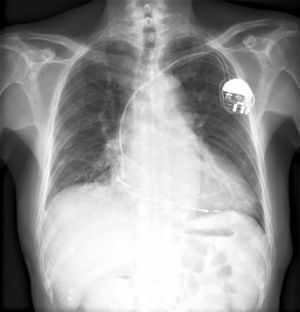 This type of pacemaker is used in patients with a reliable sinus node, but with an AV-block. DDD: The pacemaker records both atrial and ventricular rates and can pace either chamber when needed. DDDR: As above, but the pacemaker has a sensor that records a demand for higher cardiac output and can adjust the heart rate accordingly. Biventricular pacemakers (CRT-P): Leads in both ventricles are present for synchronized contraction. The lead pacing the left ventricle is usually positioned in the coronary sinus. This cardiac resynchronization therapy can improve symptoms and survival in some heart failure patients. Several optimizing methods are being evaluated to find the most effective pacing delay between left and right ventricles. They include echocardiography, finding the narrowest QRS, and invasive hemodynamic measurements with pressure and flow wires. ICD (Internal Cardioversion Device): This device can detect and treat Ventricular Tachycardia and Ventricular Fibrillation. 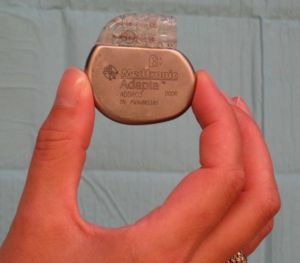 ICDs are a separate category and usually not considered pacemakers although they do have a pacing function. Usually the first treatment is anti-tachy pacing (pacing at a rate +- 10% above the ventricular rate in ventricular tachycardia, which can convert the rhythm to sinus rhythm). If this is not effective, a defibrillator shock is delivered, usually with 16-36 Joules of energy. ICDs can save lives in patients who have a high risk of ventricular arrhythmias. All ICDs have optional pacemaker activity to treat bradycardias. New biventricular ICDs have 3 leads: an atrial lead, a left ventricular lead and a right ventricular lead. Biventricular ICDs (CRT-D): an ICD with biventricular pacing option. A full list of pacemaker indications can be read in the ESC guidelines on cardiac pacing . 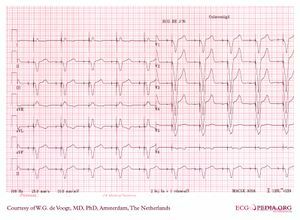 A selection of class I indications is: chronic symptomatic third- or second degree (Mobitz I or II) atrioventricular block, syncope with sinus node disease, alternating bundle branch block, and persisting AV block after surgery. Failure of appropiate inhibition results from atrial malsensing. Atrial malsensing. Atrial spikes are present right after spontaneous atrial activity. This page was last edited on 24 June 2010, at 17:32.